Although consumers aren’t yet willing to give up the steering wheel, it’s becoming obvious that smart and self-driving vehicles are significant to the future of the auto industry. Preparing for this eventuality requires a broader view of how connected and autonomous vehicles fit into a consumer’s entire web-entangled lifestyle, so we recently conducted a survey of U.S. consumers’ attitudes toward connected products. While consumers feel connected living is a boon to their lives, they also voice growing concerns about the risks that can accompany a connected lifestyle—risks that now come with their vehicles. More than half of the respondents were either “terrified” or “very concerned” about identity theft (65%) and cyberattacks (62%) because they had heard news stories about hacks and breaches of connected devices. Nearly half (46%) went so far as to indicate they would be less likely to purchase connected products as a result. Those fears easily extend to the security of a connected vehicle, especially one that is self-driven via connectivity. The good news for dealers is that value-added offerings like extended warranties can help overcome this reticence. 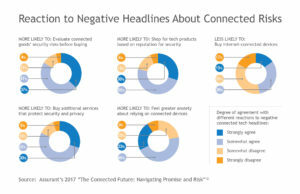 Rather than abandon their connected devices, nearly eight out of 10 respondents said that they would simply buy products and services that increase protection against such risks. Millennials, in particular, are more inclined to purchase extended warranties on technology than other generations. Nearly two-thirds of people ages 25–34 believe extended service contracts are an important part of a consumer electronic purchase. Millennials are also looking for a seamless connected experience where cars integrate with their smartphones and other devices. Therefore, it’s safe to assume that the inclination to protect their connected gadgets will include vehicles, which are a much bigger purchase than a smartphone. That opens the door to the auto industry to think beyond traditional auto-related offerings, and find ways to embed solutions that protect and solve for a consumer’s overall connected needs. Although the impact of smart and autonomous cars on the auto industry is inevitable, don’t expect consumers to abandon ownership in favor of car sharing anytime soon. When it comes to a future world where on-demand, self-driving fleets of cars are the norm, 71% of people surveyed said they would still need to own a personal vehicle. Only 8% believe they will no longer need their own car. While consumer interest in autonomous vehicles is low today, this technology will catch on eventually, as we have seen with smartphones, ride-sharing apps, drones, and other innovations. They are more at ease regarding the safety of autonomous cars. Consumers in their thirties are likely to be more comfortable doing various other activities while riding in an autonomous car, whereas people 50 and older are will probably keep their eyes glued to the road for safety’s sake. They are less concerned about the potential loss of personal freedom, which is the most-commonly cited downside to autonomous cars. When millennials and other consumers start to trust technology to take the wheel, it will be as part of a seamless connected lifestyle. Understanding how vehicles fit into that web-entangled mix will be crucial to the evolution of your dealership’s business. John Laudenslager is the president of vehicle protection services (VPS) for Assurant, Inc. (NYSE: AIZ). The full study mentioned in this piece can be downloaded at www.assurant.com/CES17. Further information can be found at www.assurantsolutions.com/VPSinformationsuite.